Hi Has anyone had an Oyster Cytrac systems fitted if so does it work in France ,how well does if perform and what model is the best ?. The roof on my Malvern is very busy and i have been informed today that the Satfi will now not fit. Any information would be helpful . We have the Oyster Caro which has a small footprint on the roof, it was fitted in 2013 but removed from a another van so unsure of the age. The Cytrac is a newer model so probably better ? I can't remember exactly how far south in europe we receive uk tv reception but we could listen to LBC Radio when in Italy and on our way back from Italy after emerging from the Mont Blanc tunnel we pulled in at the first service area for a break, switched the TV on and within a minute listened to the news on Radio 2 we've found the system excellent and more than happy with ours. 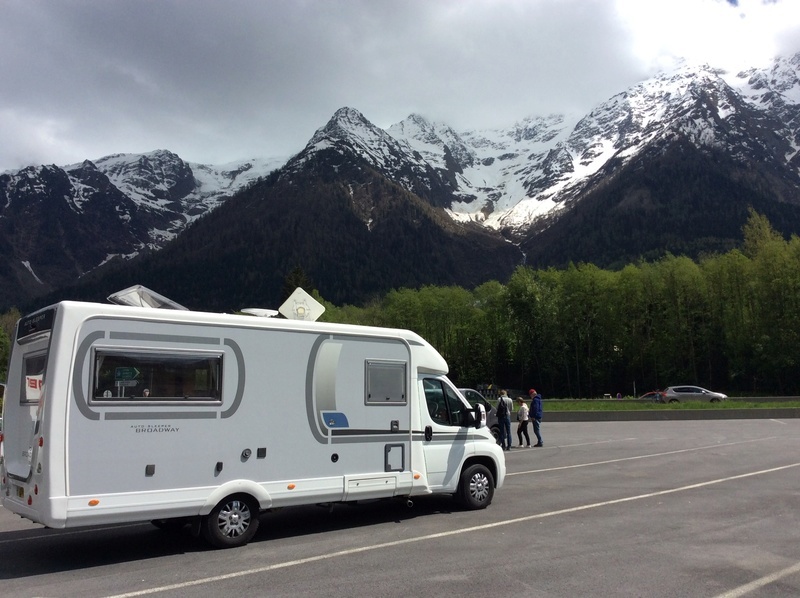 Have you thought of Motorhome WiFi instead? I have a fitted and hard wired 4g WiFi router and last night we watched The Apprentice on iPlayer using an iPad here in the south of France with a perfect picture. The system was about a quarter the price of a satellite system and works in most towns and villages. Yes you have to buy a 3 Internet With Legs data card(s), which we have 3of, but there's always a price to pay. Satellite is old hat the internet is the future. Plus you can use your smartphone package abroad to tether to. Bertie2017 wrote: Hi Has anyone had an Oyster Cytrac systems fitted if so does it work in France ,how well does if perform and what model is the best ?. The roof on my Malvern is very busy and i have been informed today that the Satfi will now not fit. Any information would be helpful . We had the cytrac fitted last year on our auto sleeper Kingham , we fitted the twin cable version it has been excellent up to know we know it worked fine down to Bordeaux. May I suggest you look at the following website and phone them up for any advice you require they are the experts in mobile sat they are based in Yorkshire near Huddersfield but travel all over the U.K. Fitting and I can say they do a superb job they test there systems on there own motorhome right down to Spain so they will have all the info you require . Hope this is of help to you . RML wrote: Have you thought of Motorhome WiFi instead? I have a fitted and hard wired 4g WiFi router and last night we watched The Apprentice on iPlayer using an iPad here in the south of France with a perfect picture. The system was about a quarter the price of a satellite system and works in most towns and villages. Yes you have to buy a 3 Internet With Legs data card(s), which we have 3of, but there's always a price to pay. Satellite is old hat the internet is the future. Plus you can use your smartphone package abroad to tether to. I've long been an advocate of 3G/4G MiFi, and we both have "3"s 'Feel at Home' contract. The problem is sometimes that, for example, France doesn't have the same coverage that we do, and it's sometimes very very slow. "All of your data allowance can be used as a personal hotspot allowance, in the UK"
We're currently in Spain having driven down through France. The 3/4g coverage has been excellent and we've watched live programs on TVCatchup and downloaded from both iPlayer and Amazon. Our data is from 3 internet with legs via our hard wired router and works perfectly. I rang 3 and was told that anyone with a mega data contract in the UK would be limited to 9gb monthly in Europe. Fyi one hour of TV over the internet uses about 1gb of data. If you're a dawn till dusk telly addict this is not for you but if you're selective it works well. Anyone considering this system should bring plenty of data cards with them as buying here is pricey. Personally I'm sticking with it as I believe the cost of data will come down in the future and I don't have to faff around with a dish. What router do you have Rich? I guess that your experience of coverage depends upon where you happen to be staying, with rural sites having poorer coverage in our experience. The MiFi is usually loaded with a 12month 12GB Data SIM, and as you say, both our phones also have the 9GB monthly allowance. Again, only our experience, but we think that a multi pronged solution works best - satellite for French campsites, a 64GB USB stick loaded with films from our Humax HDR before we set off, IPTV using phones or MiFi if it's too far South for satellite, etc. If you have good 4G and plenty of data, (not many people know this), but it's possible to use a Chromecast with your phone and a MiFi as the router too. ......and yes to your comments. Rather than a fixed system, I'm always looking at either an external antenna or to raise one of our MiFis as high as possible above the van. I find that raising the MiFi usually gives better results than an antenna in the remote locations that we seem to end up in, especially in flat terrain. Hi Bertie, when you say the roof of your Malvern is too busy for a SatFi, is that the standard set-up? I’d been looking at SatFi but will maybe need to look for something else if it doesn’t fit the Malvern. Doonhamer5 wrote: Hi Bertie, when you say the roof of your Malvern is too busy for a SatFi, is that the standard set-up? I’d been looking at SatFi but will maybe need to look for something else if it doesn’t fit the Malvern.